Private kicking lessons and private kicking instruction available for skill development. Private Kicking lessons and Kicking instruction is an excellent compliment to individuals looking to refine their skill set. It is a very quick and effective way to “individually” learn proper techniques and practice habits that will enhance skill development to the optimum level! 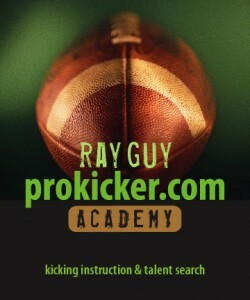 Athletes have the opportunity to receive one-on-one attention year-round with the Ray Guy/Prokicker.com Kicking Academy and Kicking Camps staff. Primary locations for these kicking lessons and instructional services are Atlanta, Georgia; Charleston, West Virginia; Charleston, South Carolina; Cincinnati, Ohio; Dover, Delaware; Kansas City, Los Angeles, California; Missouri; Memphis, Tennessee; Evansville, Indiana; Louisville, Kentucky; Morgantown, West Virginia; New Orleans, Louisiana; Indianapolis, Indiana; Knoxville, Tennessee; Augusta, Georgia; Seattle, Washington; Oakland, California; Nashville, Tennessee; Dallas, Texas; Phoenix, Arizona; and Melbourne, Australia. During the spring and summer months, private long snapping lessons and private long snapping instruction sessions will be available throughout the United States in cities listed below. This is a great opportunity for athletes living in or near these areas to effectively learn the skill fundamentals and training techniques necessary to be successful. Private kicking kicking lessons and kicking instruction sessions are scheduled in one and two hour segments on a first come, first serve basis. Please contact our office to reserve your time slot. Call us at (606) 922-8482 today!